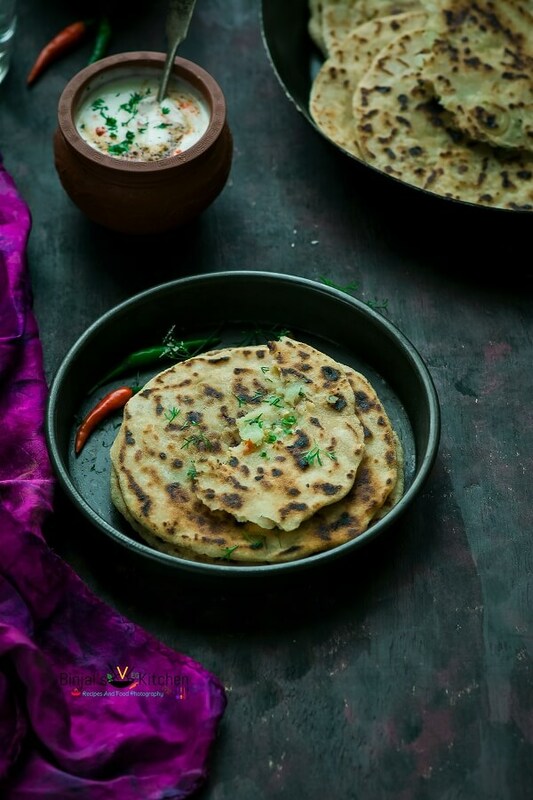 Farali Aloo Paratha or Vrat Ka Aloo Paratha, a perfect dish for Indian fasting. Farali Aloo Paratha is a gluten free. Farali Aloo Paratha is vegan too. It is mostly serve as a main with Dahi or Chutney. Some rare flours are being used to make this paratha which we normally don’t use in our routine days. Its also contain spicy aloo stuffing to enhance the taste. Fasting in the festivals like Navratri doesn’t mean we need to eat tasteless and bland fasting food. Some people eat rock salt in their food and do fasting for all nine days of Navratri. This is one of the most delicious recipe for worshipers. This is a potato-based dish has all the spices that are acceptable during fasts. This is very common fasting dish and very popular among all age group people. 1. Take a mixing bowl, grate the boiled and peeled potatoes or you can mash till smooth. 2. Add crushed green chilies, ginger, salt, amchoor powder, cumin powder, lemon juice, chopped coriander leaves and mix it well. 3. Divide the mixture and make the small lemon sized balls and keep aside. 4. Take another mixing bowl. Add all flours, salt and mix all together. 5. Now add ½ cup of water and knead it, use more little water if required and make a dough. It should be like roti dough. 6. Add oil, knead it again, cover it and keep aside for 10 mins. 7. Take the dough and make the medium sized balls. 8. Roll or just flatten it using your hand palms and finger into the small circle like puri. 9. Place the stuffing ball on the center of the prepared puri, bring the edges together to cover from the all sides and make a round ball. 10. Dust it into the flour, flatten it, tap over it slowly using fingers and hand palm, and make a big circle to make paratha, use flour to avoid tearing the edges. 11. Heat the griddle and place the prepared paratha over it and shallow fry it using 1 tsp oil till both sides become golden brown. 12. 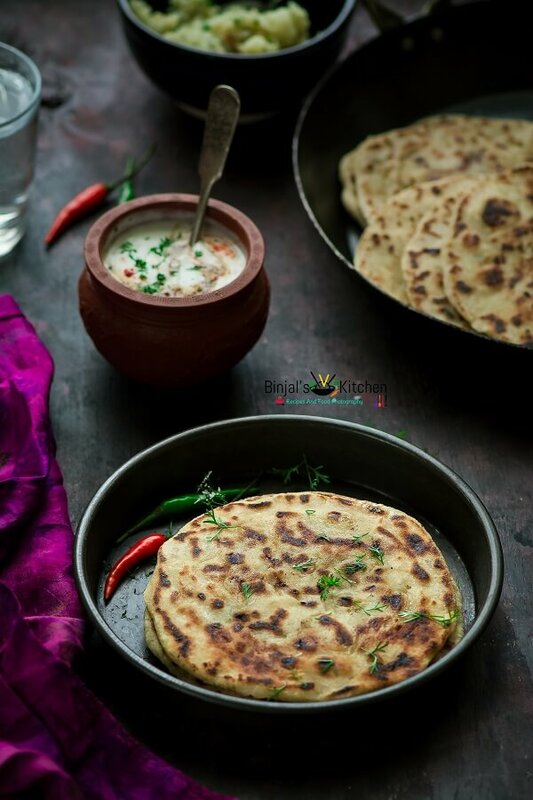 Use the same method for the remaining stuffing and dough and make more Farali Aloo Parathas, serve hot top with ghee, butter and enjoy with Dahi or chutney. • You can add shinghada (water chestnut) flour instead of kuttu ka aata. • Adjust the spice level as per your taste. 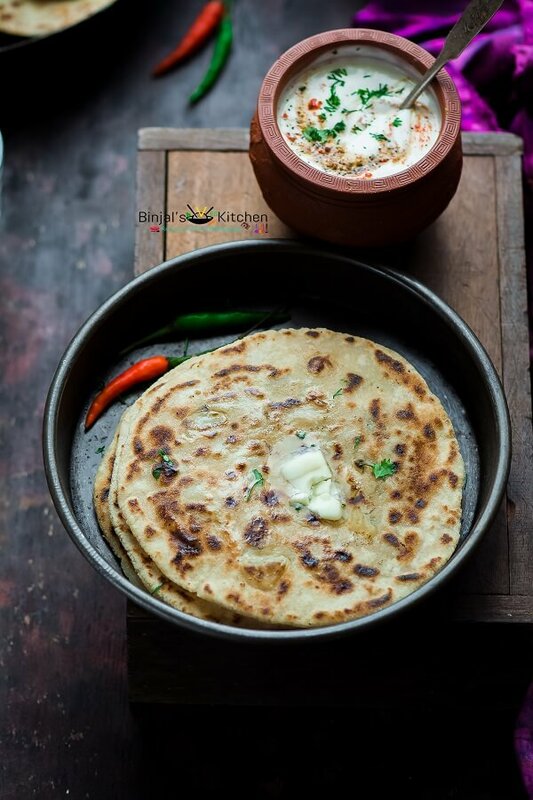 Farali Aloo Paratha or Vrat Ka Aloo Paratha, a perfect dish for Indian fasting. Farali Aloo Paratha is a gluten free. Farali Aloo Paratha is vegan too. It is mostly serve as a main with Dahi or Chutney. Some rare flours are being used to make this paratha which we normally don’t use in our routine days. Its also contain spicy aloo stuffing to enhance the taste. Fasting in the festivals like Navratri doesn't mean we need to eat tasteless and bland fasting food. Some people eat rock salt in their food and do fasting for all nine days of Navratri. This is one of the most delicious recipe for worshipers. This is a potato-based dish has all the spices that are acceptable during fasts. This is very common fasting dish and very popular among all age group people. Take a mixing bowl, grate the boiled and peeled potatoes or you can mash till smooth. Add crushed green chilies, ginger, salt, amchoor powder, cumin powder, lemon juice, chopped coriander leaves and mix it well. Divide the mixture and make the small lemon sized balls and keep aside. Take another mixing bowl. Add all flours, salt and mix all together. Now add ½ cup of water and knead it, use more little water if required and make a dough. It should be like roti dough. Add oil, knead it again, cover it and keep aside for 10 mins. Take the dough and make the medium sized balls. Roll or just flatten it using your hand palms and finger into the small circle like puri. Place the stuffing ball on the center of the prepared puri, bring the edges together to cover from the all sides and make a round ball. Dust it into the flour, flatten it, tap over it slowly using fingers and hand palm, and make a big circle to make paratha, use flour to avoid tearing the edges. Heat the griddle and place the prepared paratha over it and shallow fry it using 1 tsp oil till both sides become golden brown. 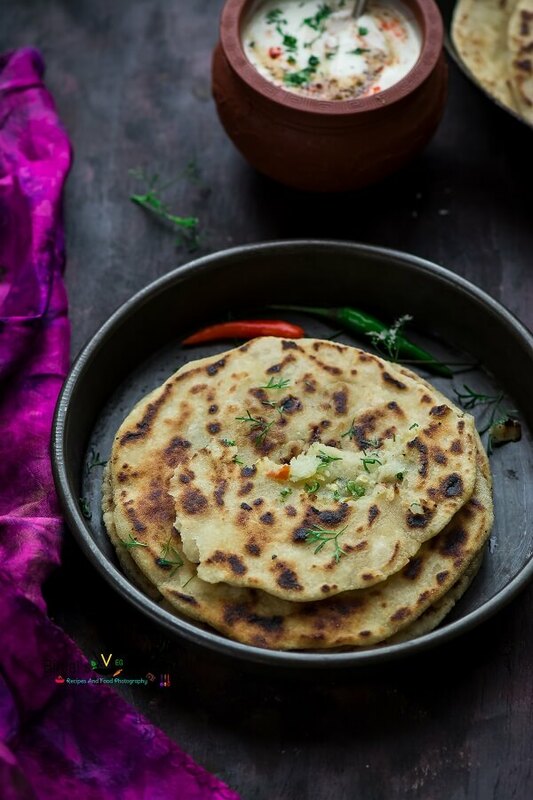 Use the same method for the remaining stuffing and dough and make more Farali Aloo Parathas, serve hot top with ghee, butter and enjoy with Dahi or chutney. • Adjust spice level as per your taste. Very interesting ! Will give it a try!